I joined the U.S. Navy after graduation from high school in 1974 to follow in the footsteps of my Dad, John R. Lewis, who served in the Army during World War II. My goals were to serve my country and to work toward a college degree in Business Administration. 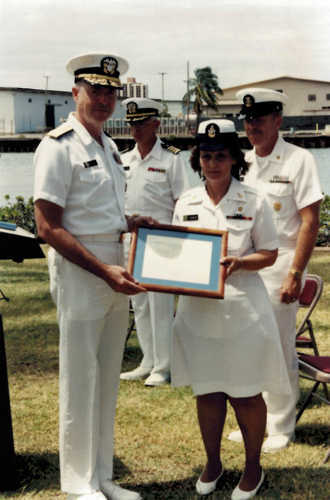 During my 20 years as a Data Processing Technician, I was responsible for a variety of duties supporting land-based military installations and ships and submarines. 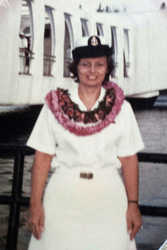 My last duty station was at Pearl Harbor, Hawaii. I remember driving to work every day and seeing the U.S.S. Arizona Memorial and thinking about the sacrifices the men and women who served during WWII made for all of us. I retired from the Navy in 1994 and moved home to Belfast, where I began asking myself how I could make a difference in supporting veterans and active duty troops. I feel that we owe it to them to do whatever we can to support military personnel and recognize them for their service and sacrifices. In addition, supporting the families of our Troops and Veterans is so important. I am a Maine Troop Greeter, and I travel to Bangor International Airport at least two to three times a month to welcome troops home, and to let the ones leaving for service know we’ll be there to greet them when they come home. I’m on the board of directors for the Maine Honor Flight program, where we ensure all World War II veterans and terminally ill veterans have the chance to visit the memorials of their respective branches in Washington, DC In October 2014, I traveled as a guardian on a trip with 40 World War II veterans from Maine. It was such an incredible experience; my Dad was a World War II veteran. He passed away many years ago. He was a humble, quiet man and didn’t really talk about his military service. 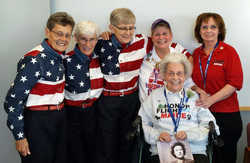 Going on this trip, I got to talk to the World War II veterans. Now, I get it. I worked to raise awareness about the Women in Military Service Memorial located at the gateway to Arlington National Cemetery, built in honor of all women—past, present and future, who serve our country. Recently, I launched a Facebook page, Maine Women Veterans, where I’m working to connect and network with other women veterans and active duty troops. I spend most of my free time volunteering, because I feel like I’ve been blessed in my life and want to give back. What they say in the military is that we don’t stop serving. I really have a passion for being involved in the community and the state of Maine, especially with our veteran population. My volunteering work makes me feel very proud to be an American. Veterans are often quiet about their service. But once you connect with them, they’re glad you did. ©2000-2016 Maine Historical Society, All Rights Reserved. My Maine Stories is a part of the Maine Memory Network, a project of the Maine Historical Society.